Seafood Laksa — potato chips are not dinner. potato chips are not dinner. I've always wondered what criteria determined the spiciness of a pepper. Did some guy named Scoville sit down and eat a bunch of peppers and rate them from not that hot to kind of hot, to really really hot and thereby create the Scoville Scale? I never wondered long enough to actually look it up...until I prepared this soup. Thai peppers will put a sting in your eyes at first cut. which didn't really surprise me. The pair of red, throbbing, and swollen pepper-burnt hands I was left with after cooking however, left me feeling quite surprised and very silly. So the lesson of the day is: no matter how short the contact you have with this tiny little spicy pepper, WEAR GLOVES! Unless of course you enjoy sitting around with a DIY sugar and olive oil paste on your hands. Oh, and in case you were still wondering, a pepper's spiciness is decided by how many sugar drops it takes to neutralize the heat of the pepper. Found that out the hard way. Don't let my burnt hand tale put you off, it was completely worth it. For something so quick and easy (basically just throw a bunch of ingredients in a pot! ), it has such a huge depth of flavor. It's not spicy, and doesn't need to be. 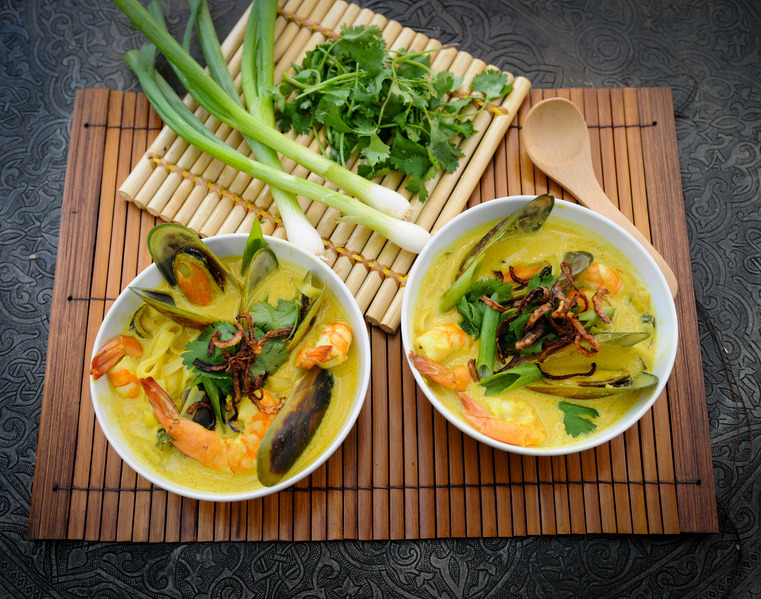 The shrimp paste, onions, tumeric, coriander, and cilantro add plenty of flavor and the creamy coconut milk balances out the spiciness of the thai pepper perfectly. If you are a seafood lover, this one's for you. Sweat your sliced onion in a large saucepan over medium heat for 3-5 minutes. Add your Laksa paste and saute for about 3 minutes to toast the spices and really bring out their flavor. Add coconut milk, water/broth, fish sauce lower the heat to low and simmer for 25 minutes. Prepare rice noodles by soaking them in boiling water for 10 minutes, drain and set aside. Add noodles and bok choy to the Laksa stock , and stir until all noodles and greens are immersed. If your noodle to liquid ratio is not to your liking, feel free to add more water or broth at this point. Taste your broth and add salt and pepper to taste. Add your mussels and shrimp, increase the heat to medium-high until the shrimp are a nice pink color. No longer than say, 10 minutes maximum. Keep a close eye on it as you don't want to overcook your seafood! Garnish with plenty of cilantro, green onion, and crispy shallots! 2. Sweat your sliced onion in a large saucepan over medium heat for 3-5 minutes. Add your Laksa paste and saute for about 3 minutes to toast the spices and really bring out their flavor. 3. Add coconut milk, water/broth, fish sauce lower the heat to low and simmer for 25 minutes. 5. Prepare rice noodles by soaking them in boiling water for 10 minutes, drain and set aside. 7. Add noodles and bok choy to the Laksa stock , and stir until all noodles and greens are immersed. If your noodle to liquid ratio is not to your liking, feel free to add more water or broth at this point. Taste your broth and add salt and pepper to taste. 8. Add your mussels and shrimp, increase the heat to medium-high and cook until the shrimp are a nice pink color. No longer than say, 10 minutes maximum. Keep a close eye on it as you don't want to overcook your seafood! *Garnish with plenty of cilantro, green onion, and crispy shallots!